This Cushion-Cut Double Halo Diamond Engagement Ring by Auriya showcases an enchanting 1 carat cushion-cut diamond center stone with soft, rounded corners and a stunning sparkle and fire. The pillow-cut diamond sits in the center of a double halo of sparkle and fire. While the halo ads volume and depth to the center stone, additional diamonds line ¾ of the way down each shoulder, making a surprise appearance in the gallery creating a sparkle and fire from every angle. This gorgeous diamond ring is beautifully crafted in your choice of 14k Yellow Gold, White Gold or Rose Gold that shines with a gleaming high-polish finish that is sure to take her breath away. Each of the diamonds are hand-matched in an H-I color and SI1-SI2 clarity rating creating a memorable and consistent sparkle and shine throughout. My fiance' propsed to me with this ring and it is ABSOLUTELY gorgeous!!!!!! The craftsmanship on this ring is exquisite! I can hardly function for always looking at it :) The appraisal value for this ring is so much more than it actually cost on this site. I can't say enough wonderful things about this amazing creation!!! It was actually requested that I create a FaceBook page for the ring alone, because it is so beautiful!!! I love you, my King, for presenting me with such a beautiful adornment. My left hand looks royal!!!!! This is the best ring you can get for this price ANYWHERE. We shopped and shopped and this ring is above and beyond any of the other rings we saw in this price range. Very sweet and dainty, and yet it has the bling factor. The center diamond was accurately represented in terms of color and clarity, and it was actually greater than a full carat. Jewelry comes with appraisal and certification. But most of all, I would have to give kudos to the overstock.com customer service. I now know why they are award-winning -- giving up a lot of money for something you have not seen nor touch is a great risk, but they supported us in this purchase from beginning to end. I cannot say anything wrong with this product or overstock.com. Absolutely fabulous. This ring is pretty, a great price, but the center stone isn't very clear. The diamond is certified but i have to decide if I want to return it or not. 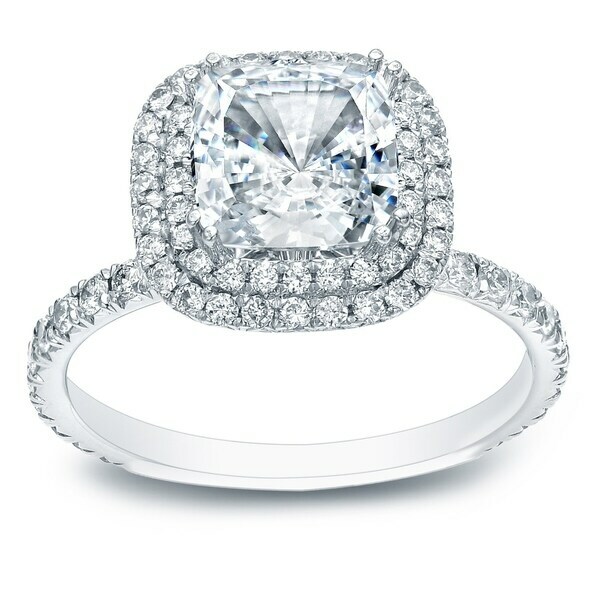 This ring is beautiful, but I am skeptical about center carat size. I will be taking it in to have it appraised. I have another ring with a 1ct center stone and this one looks smaller. We are extremely satisfied with the quality and the price. We read the other reviews and decided to give it a chance without seeing the ring beforehand. The center diamond is perfect. The ring comes with an appraisal for the center diamond which by itself is more than you will pay for the entire ring. BEAUTIFUL! This ring is so perfect. This ring is quite impressive. The side diamonds are very clear and sparkly. Just pay close attention to the grade of the center stone. Mine was somewhat yellow, so be sure to communicate with a customer service agent to work this out. All aspects of the ring were at the level or higher than expected. Shipping was free and it was two day overnight. This Ring was absolutely flawless when i presented this to my fiance she was speechless . all i got was a whoa . she was so excited. it came with an Certification . and Appraisal very pretty ring lots of compliments on it! i would highly recomend this ring ! Best decision Ever! It is sooo beautiful and sparkles so much. I constantly stare at it, and so does everybody else. The compliments have not stopped . The middle diamond has a bit of color but it does not bother me at all. My wife is told daily how beutiful the ring is. My fiancee loved this ring. It is a beautiful diamond. What I loved about this was the customer service I received from Overstock. Their CS team is amazing and provided awesome support. TY OS! "I bought this ring for my wife and I’d like to know where I can find the matching band." "Previous inquiries from others have responses that state that there is a band available (special order). I have contacted Overstock in reference a matching band for this Auriya #15179278 and have had no luck. Who is the best person to contact about this? Customer service is unaware of any band to go with this. And an item number please"
Hello Timothy G., you will be contacted by Customer Care who can further assist you with your request. Have a great day. "Is there an additional manufacture diamond guarantee that comes with this ring above the 3 year purchase? I obviously will want to wear this for the rest of my life..lol. Most reputable jewelers give a diamond guarantee. Also, after the 3 years, can you purchase another protection plan?" Hello littlemzt, this ring includes a 5 year limited manufacturer warranty. An additional jewelry protection plan is available for purchase. After the protection plan warranty has expired, it can be renewed at the contract administrator's discretion. Thanks for shopping with us! "What is the exact size of the center stone?" Hello Itqueen, the center stone is 1 carat and the side stones are 3/4 carat making this ring 1 3/4 carat total. Thank you for shopping with us. "hi! why isn't this ring stamped with 14k?" Hello Geoffrey G., the actual ring does have a 14k stamp on it. Thank you for shopping with us! "Do you make a matching wedding band? Maybe an eternity diamond band?" Hello brandona1987, yes, we do have a matching wedding band available for special order. Please contact customer care at 1-800-The-BIG-O (843-2446) to place the order. Thank you for shopping with us!